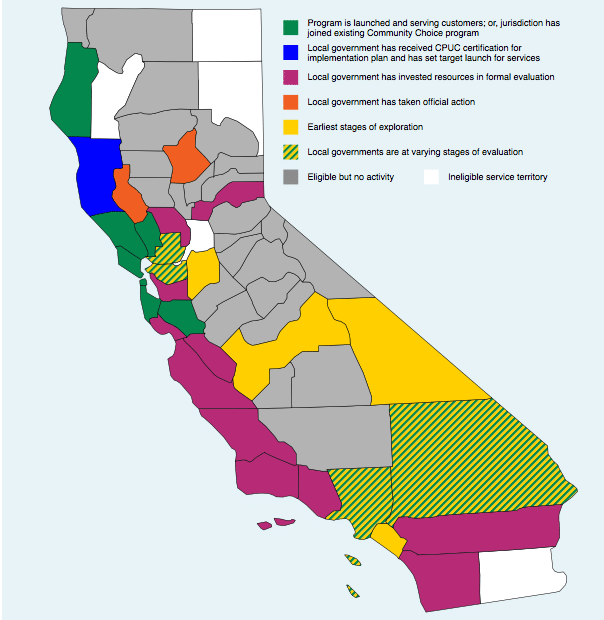 The Central Valley, famous as the agricultural hub of the California, is a prime region for clean energy and Community Choice Aggregation (CCA, also known as Community Choice Energy) programs. The Valley has a wealth of diverse energy resources, human resources, and the available land, rooftops, parking lots, and other suitable sites needed to develop these energy resources. Local control of energy dollars enabled by Community Choice may offer the best solution to boost the local economy, increase employment, and achieve environmental goals, while potentially lowering electricity generation rates. 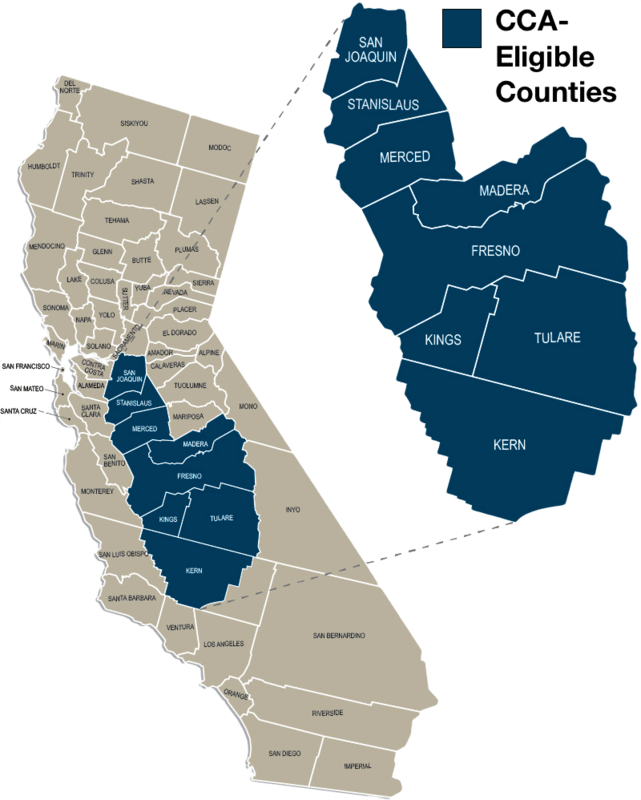 On this page you will find information relating to our work and outreach in the region, as well as information relating to the cities and counties that make up the San Joaquin Valley. We welcome your thoughts & suggestions. 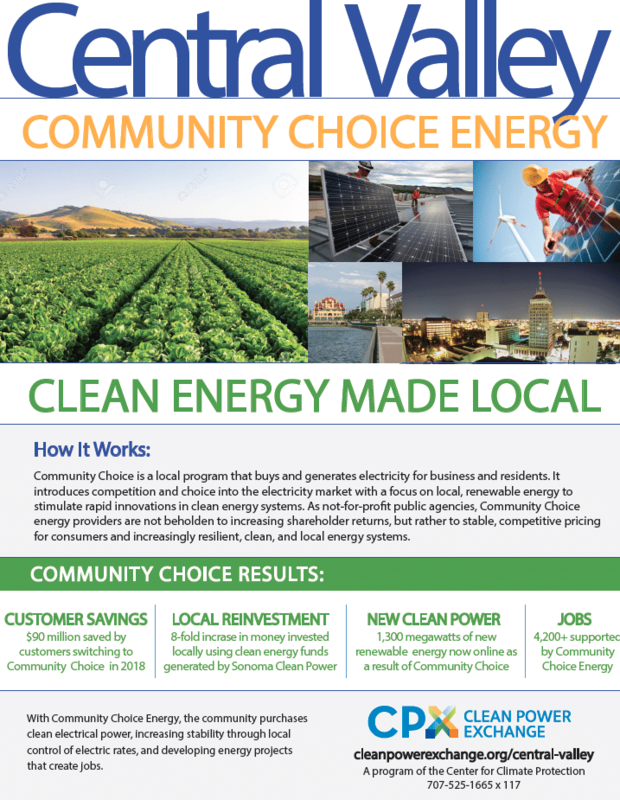 Community Choice Energy — In the News! It is time to revisit Community Choice Energy for the Central Valley, by Al Galvez, The Fresno Bee, March 22, 2019. October 17, 2018. This webinar focused on challenges and opportunities of establishing Community Choice in California’s Central Valley. Click HERE for the recording and associated materials for this webinar. June 29, 2017. This webinar presented the findings of an independent analysis of the economic impacts that can be expected over a six-year period when a CCA is established and increasing increments of renewable energy are procured for customers. Click HERE for the recording and associated materials. Click here to meet the Central Valley team! 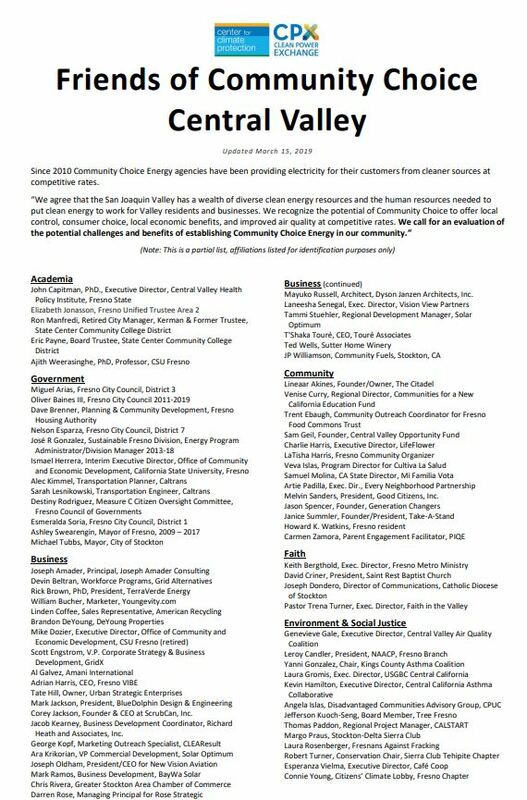 If you support evaluating Community Choice Energy in your community, please sign on to the growing Friends of Community Choice, Central Valley list to help advocate for clean and local energy! For the list of current Friends of Community Choice – Central Valley, see the link to the right. This paper, prepared for the Center for Climate Protection by Ben Foster, Fosterra Clean Energy Consulting, examines the economic benefit potential afforded by Community Choice. This level of deployment would create over 8,000 jobs and drive nearly $850M in new economic activity. It could also result in shutting down fossil energy generation, the holy grail for this area with some of the worst air quality in the nation. 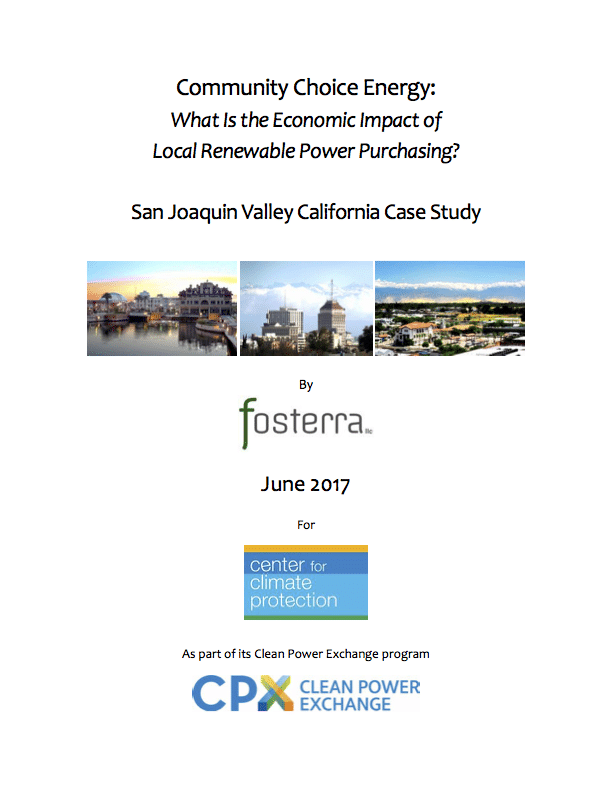 In August 2016 Clean Power Exchange, a program of the Center for Climate Protection, released new survey results about local and renewable energy preferences in the San Joaquin Valley. According to the survey, electric utility ratepayers in the San Joaquin Valley – from San Joaquin County to Tulare County – are interested in alternatives to the current energy system. California’s policy to achieve 100 percent of our electricity from renewable sources by 2045 will entail a significant deployment of large-scale solar photovoltaic (PV) installations. But in places like the San Joaquin Valley, proposed installations have engendered conflicts with agricultural and conservation groups, who fear a resulting loss of valuable lands and the species and farming and ranching that depend on them. To address the challenge, Berkeley Law’s Center for Law, Energy and the Environment (CLEE) partnered with Conservation Biology Institute (CBI) and Terrell Watt Associates to develop a new process to find “least-conflict” lands in the eight-county San Joaquin Valley region. The project team convened leaders from the agricultural, conservation, and solar PV development communities, and included tribes and key agencies. 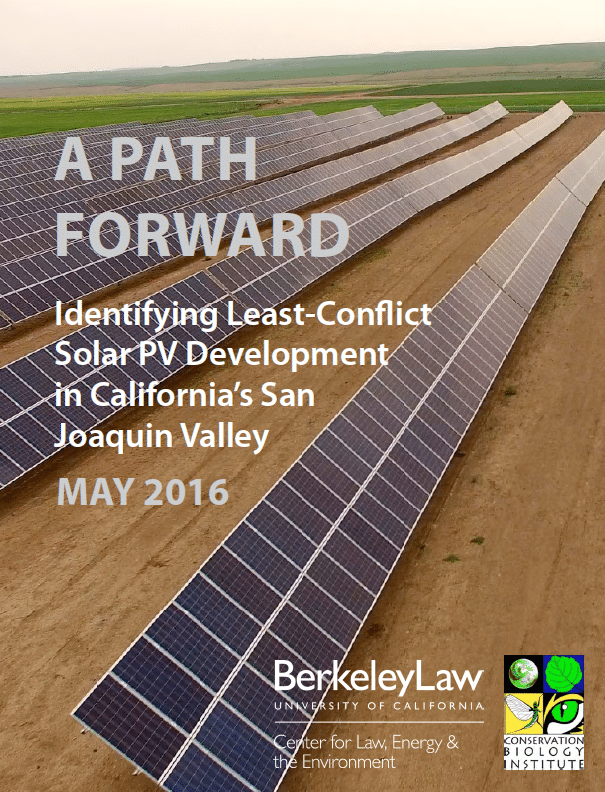 We asked the groups one question: from your perspective, where are the least-conflict lands for solar PV development in the Valley? Writing an email to your representative or a letter to the editor? Here are some talking points to consider. For a Word doc click HERE and for a googledoc click HERE.